The fields and moors of West Cornwall contain a wealth of ancient monuments, standing stones, Stone, Bronze and Iron Age forts and villages and the area has a rich heritage of myths and legends handed down through the centuries. 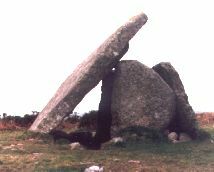 There are four Stone Age or Neolithic burial tombs (known in Cornwall as quoits) consisting of three or more upright slabs with a flat capstone on top on the West Penwith Moors. 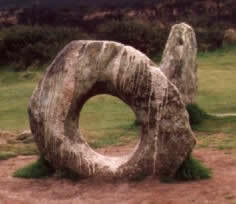 These are :- Chun Quoit, Zennor Quoit, Mulfa Quoit and Lanyon Quoit. Both Lanyon and Chun are easily found from the road. Lanyon was rebuilt in 1824 after a prank dislodged the cap stone. Another interesting stone tomb is Bollowall Barrow on Carn Gloose. This is a complex structure of a circular mound with a domed mound inside containing several burials. Iron Age hill forts include Chun Castle, Trencrom and Castle-an-Dinas with cliff castles at Kenidjack and Gurnards Head. Village settlements of particular interest are Carn Euny with its fougou and Chysauster. Standing stones of note are the Pipers, Boswens and Men Scryfa. The latter has a latin inscription and stands in the middle of a field close to the famous holed stone of Men an Tol. Most of the Stone Circles have folk names as there are many stories about the stones being maidens or hurlers turned to stone for dancing or hurling on the Sabbath. (Hurling was a ball game played in Cornwall centuries ago.) Nine Maidens, Merry Maidens and Boscawen Un are good examples.